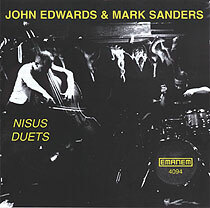 John Edwards, double bass; Mark Sanders, percussion. Recorded at Gateway Studios, London on 15 July 2002. Front cover photograph (reproduced above) (at The Grapes, Sheffield) by David Clayton.